Vladimir Putin, Ukraine, and state TV: What Russians see when they tune in for news on Crimea. The bizarre, mixed-up world Russians see when they watch the latest news on Crimea. 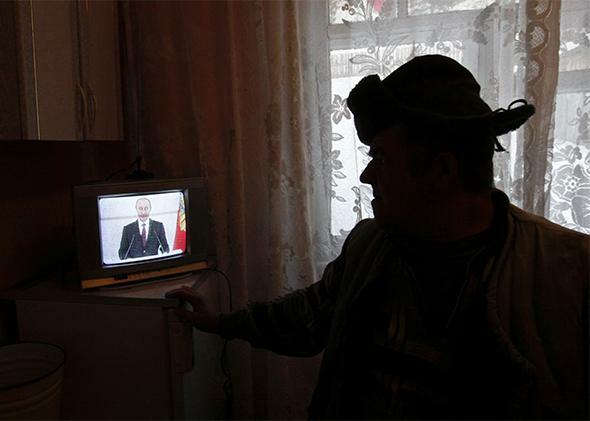 A man watches a TV broadcast in Verkhniaya Biryusa, Russia. Another day of crisis in Ukraine, another day of Vesti, one of the flagship news programs on Russian state TV. Wednesday’s broadcast led off with a report from the newborn “Autonomous Republic of Crimea,” where, as the voice-over intones, “state institutions are rapidly taking shape.” The new republic’s armed forces and the new border guard service (who are both equipped and uniformed exactly like Russia’s) are getting down to work. All this is happening, apparently, entirely spontaneously—there’s nary a mention of the involvement of Russian troops or officials. All is calm in Crimea, apparently: As the camera pans over tidy buildings and happy passersby in the capital of Simferopol, the commentator is at pains to contrast the scene with the burnt-out buildings and smoldering barricades in Kiev. Next there’s footage of Secretary of State John Kerry’s visit to Kiev, where, we’re told, “The United States is unreservedly supporting those who came to power through a coup.” After Kerry’s meeting with the leaders of Ukraine’s interim government, we see him shaking hands with leaders of the Euromaidan protest movement; the commentator pointedly notes that Kerry’s encounter with these “ultrarightists” is even “friendlier” than his session with the representatives of the government. That’s followed by a sequence on demonstrations across Russia in support of the “Russian-speaking population” in Crimea. The demonstrators stand in serried ranks, holding neatly lettered signs proclaiming “We’re against fascism” and “Glory to Berkut” (the notorious Ukrainian riot police who were responsible for much of the violence against the demonstrators in Kiev, where more than 80 protesters were killed). Then the show’s host announces a “breaking story”: An official in Oslo says that Russian President Vladimir Putin has been nominated for the Nobel Peace Prize. And with that the news comes to an end. This is a remarkable moment in the evolution of Russia’s post-Soviet media landscape. The collapse of the Soviet Union ushered in an era of unprecedented press freedom. As was to be expected, that flowering wasn’t always tidy. Corruption among journalists was rife, and many media outlets were controlled by well-connected business tycoons, the “oligarchs,” who often used the reporters in their employ to further their private agendas. Overall, though, pluralism reigned. Competing viewpoints proliferated. Putin, of course, put an end to all that. He restored state control over much of the media—especially when it came to national television networks, by far the leading source of news for the bulk of the population. One of his first acts as president was to crack down on the last big private TV broadcaster, NTV, chasing its oligarch owner, Vladimir Gusinsky, into exile. Putin’s plans went much further, though, than simply re-establishing the government’s monopoly over the media that mattered. He also had some very specific ideas about the content he wanted to see. The turmoil in Ukraine is now revealing, more dramatically than any other event in recent memory, the fruits of Putin’s effort to re-engineer the national soul. It’s an odd farrago of Soviet-era memes, nationalist chestnuts, and postmodern meta-narratives, all the disparate elements uneasily suspended in a bubbling broth of paranoia and defensiveness. Putin’s latest press conference—his first after days of silence—showcased the paradoxes underlying the new Russian worldview. He told reporters that he sympathized with the Ukrainian protesters who brought down Viktor Yanukovych, then hazarded the claim that the killings of demonstrators had been arranged by the protesters themselves as a provocation. He insisted that Yanukovych is still the legitimate leader of Ukraine, then went on to describe him as a man with “no political future.” He refused to acknowledge that the Russian soldiers besieging Ukrainian military bases in Crimea are acting on Russian orders, doggedly maintaining the transparent fiction that the only forces acting in Moscow’s interest on the peninsula are remarkably well-organized local “self-defense committees.” And he cited the independence of Kosovo as a precedent for the establishment of a Russian-dominated republic in Crimea—even though Russia spent years stubbornly rejecting Kosovo’s claims for statehood as a violation of Yugoslavia’s sovereignty. Observers have often remarked upon Putinism’s peculiar synthesis of Soviet nostalgia, czarist imperialism, and ethnically based nationalism. But the chaos in Ukraine has brought the mix to a boil. In recent weeks, we’ve witnessed the Russian government angrily objecting to the destruction of Lenin statues by Ukrainian demonstrators—the same Lenin who referred to Russian nationalism as “Great Russian Chauvinism,” regarded the czars as his mortal enemies, and incited mob violence against the Russian Orthodox Church (whose priests have been seen blessing the troops in Crimea). We’ve seen the Russian government issue blanket denunciations of Ukraine’s Euromaidan movement as “fascists” and “anti-Semites” (even while Russian nationalists back in Moscow blame the violence in Kiev on the machinations of nefarious “Zionists,” a blood libel that has failed to prompt expressions of concern from the Kremlin). It’s easy to forget, perhaps, that the inspiration for Kiev’s protests was a widespread desire among Ukrainians to see their country more closely associated with the European Union—an earnestly liberal and ponderously bureaucratic organization that couldn’t have less to do with “fascism” in any of its forms, real or imagined. It’s worth noting, by the way, that Ukrainian protesters emphasize this point by referring to their movement as Euromaidan, while Russian media religiously avoid using the “Euro” prefix—perhaps because it would remind their audiences of the inconvenient origins of the protests in the center of Kiev. One of the strangest manifestations of Russian reactions to the Ukrainian crisis has been the almost reflexive revival of Soviet techniques of argument. I recently appeared on a U.S. radio talk show with a Russian journalist, who proceeded to scold Washington for its “double standard” on matters of democracy. “I just finished a news report on a Catholic nun here in America who was sentenced to three years in jail for a protest against nuclear energy,” he declared. “And this is the same country that claims to be worried about freedom in Ukraine.” This, of course, was exactly the technique practiced by Russian reporters during the Cold War, who would routinely respond to any criticisms of Moscow’s human rights records by citing the civil rights movement or the persecution of American communist leader Angela Davis. This sort of argument made a kind of perverse sense in a world where two universalist ideologies—Western liberal democracy and Marxism-Leninism—were fighting each other for supremacy. But invoking the fate of that Catholic nun doesn’t really wash when you’re trying to justify the cause of Russian nationalism; if you’re a good Russian nationalist, you don’t really give one whit about the fate of a Catholic nun. You’re just using her as evidence that everyone is equally grubby and hypocritical when it comes to human rights. Soviet Marxists were actually trying to win over adherents. Russian nationalists are simply trying to denounce everyone else. Of course, a lot of Soviet propaganda was about telling brazen lies and hoping that some of them would stick. This technique is undergoing a revival as well. Putin has cited “existential threats” to the lives of Ukrainian Russians as the rationale for military intervention in Ukraine, and the Russian media have been working overtime to manufacture such examples—so far to little effect. Lately Russian TV has triumphantly reported on the huge flows of desperate Russian-speaking refugees from Ukraine (the number of 675,000 has been mentioned). Yet reporters who have turned up at the borders to check on the accounts have witnessed only business as usual. The threat of war still looms, and the prospects for East-West relations are grim. But I’m happy to say that amid all the bad news there’s still some space for the odd moment of unintended comedy. Back in the old days, the Soviets liked to validate their views by citing American “experts”—usually fellow travelers of various stripes who could be counted on to stick to the party line. Now the Russians are revisiting that old conceit—but because the old ideological guidelines have vanished, the results can be rather bemusing. So, for example, recent Russian media commentators on the crisis in Ukraine include Paul Craig Roberts, a former Reagan administration official who’s now better known as a 9/11 truther and conspiracy expert, as well as the indomitable Steven Seagal, who’s been admonishing the Western press “to start telling the truth about Russia.” God save the Czar.